TeamCast is prepared and ready to actively participate in the upcoming IBC2016 event in Amsterdam with a number of product offerings. The company is debuting their Tyger satellite modulator at IBC2016. This is a new satellite modulator that offers the same high level of performance as previous Vyper modulators, with the benefit of an unprecedented high throughput. Tyger offers rates up to 480 Mbaud for DVB-S2 and DVB-S2X standards (meaning several Gbits/s rate per transmission). Furthermore, to maximize capacity and spectrum efficiency and reduce overhead, it uses the latest algorithms called GSE to enable more efficient IP transport. Tyger comes with an Up-to-date ESP (Enhanced Satellite Pre-correction) technology and also meets the requirements of the DVB “Annex M,” making the unit capable of mixing services (broadcast and broadband) over the same satellite carrier. Also on stand will be the company's Carrier ID solution—DVB-CID is a standardized key feature which helps satellite users and operators to quickly solve satellite interference problems. TeamCast has designed a complete solution (transmission and reception) which deals with this latest feature also called Carrier_Id. Thanks to TeamCast range of products, satellite users can manage and prove that they are compliant with this new feature which is becoming mandatory by regulation. TeamCast demonstrates first how its VYPER satellite modulator is adding the CID carrier to the transmitted carrier so that the resulting signal can be easily tracked and identified with proper receiving equipment. The demonstration also includes the use of TeamCast’s brand new CID receiver, which decodes the CID signal and allows operators to check and analyze carriers to ensure the DVB-CID signal is present and compliant with regulations. An additional demo will center on digital precorrection, a key feature for increasing the usable payload of a satellite transponder. Digital pre-correction of the satellite’s signal chain is a technical challenge. Firstgen solutions have been available on the market for a few years. The benefits they bring are not as high as initially expected, especially for the low order constellations which are the most widely used: QPSK and 8PSK. TeamCast is introducing a new and innovative digital pre-correction solution based on 20 years of experience for its VYPER range of satellite modulators. 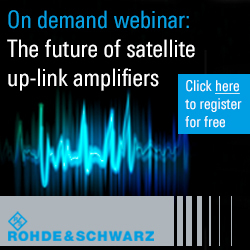 This new technique of pre-correction for satellite applications offers significant gains in budget margin, from 1.5 dB for 8PSK to 5 dB for 32APSK. It is available as a simple software upgrade for the VYPER modulators. TeamCast’s stand is located at 2B.51.